Binding of Isaac mod adds a lot of items and creatures from the same horror. There is really a lot of things, you can put on the armor set, which will make you similar to the main character of the Sacrifice of Isaac. there will be new bosses (with which you have to fight), as well as weapons killing them. The cube v2 map for Minecraft PE 0.11.XIf you look at Minecraft planet from outer space, it might look something like this. 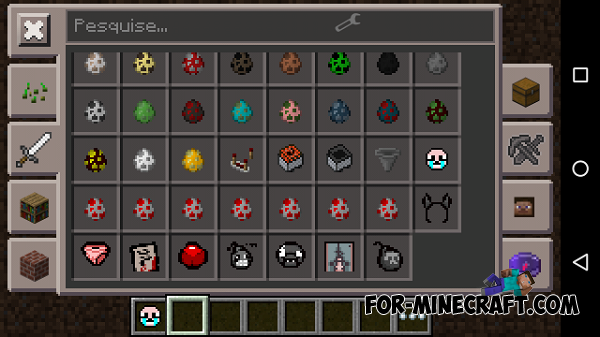 OMG dis mod is da bast! Your job is survive and increase small floting island. But how to get items? You can sell or buy them in a shop! There are even two PVPs, spawn, parkour, Vip Pig, Vip Cow (you can buy Vip in the shop) and three events. This map is only for 1-2 players.